You asked for more ... and the Planet Express crew delivered! 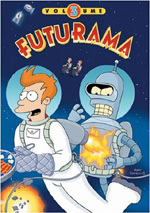 Welcome back to Futurama, the light-years-ahead-of-its-time animated series from The Simpsons creator Matt Groening ... Join Fry, Bender, Leela and the rest of the gang for 13 hilarious new episodes that tackle some of the most controversial subjects in the galaxy ... including evolution, mind exchange, feline intelligence and robosexual marriage. Hey, it could happen! What will it take to kill off Futurama? A whole lot, apparently, and that’s fine with me, as I’m happy to see the series’ continued existence. After Fox canceled it in 2003, it existed only as reruns until it returned via four direct-to-video movies in 2007-2009. Those did well, so it came back as a regular TV series on Comedy Central in June 2010. That first batch of 13 Comedy Central episodes encompasses the contents of this two-disc set. I’ll look at the 13 shows in the order presented here. The plot synopses come straight from the Blu-ray’s packaging. Rebirth (aired June 24, 2010): “After a devastating spaceship crash, the Professor attempts to resuscitate the crew with his birth machine.” The series relaunch proves to be reasonably enjoyable, but don’t expect a great episode. It has some good laughs – especially from Bender, who has to party to prevent an explosion – but it’s not packed with great material. Still, it’s a nice resumption to the show. In-A-Gadda-Da-Leela (aired June 24, 2010): “Leela and Zapp Brannigan find themselves stranded on an Earth-like planet.” God help me, but I do love Billy West’s Nixon impersonation. Though that’s a personal highlight, a mix of other good moments occur here. While not a classic episode, it moves things along well. Attack of the Killer App (aired July 1, 2010): “Fry posts an embarrassing video of Leela online.” Apple is an easy target, but that doesn’t mean “App” doesn’t offer a fun spoof of online silliness. Has there ever been a better tweet than “burpin’ eggs, scratchin’ my underarm fungus, lookin’ for love”? I don’t think so, and that’s just one of the amusing moments in this solid episode. Proposition Infinity (aired July 8, 2010): “Bender leads a campaign to legalize robosexual marriage between humans and robots.” Hmm… I like the focus on Bender, my favorite character, but don’t care for the emphasis on Amy, one of the series’ least appealing personalities. The robot side of things works too well for me to be too down on the Amy side of things, though, and it gets in a lot of funny bits along the way. It’s probably the season’s best show to date. The Duh-Vinci Code (aired July 15, 2010): “The crew races to future Rome to unearth the shocking secret of Leonardo Da Vinci.” Isn’t 2010 a little late for a Da Vinci Code spoof? Not that all parodies need to be current, but this one feels like a script that sat on the shelf for about five years. It’s not a bad episode, but it never becomes especially inspired. Lethal Inspection (aired July 22, 2010): “Bender learns that he suffers from a mortal manufacturing defect.” Even with an emphasis on Bender, “Inspection” feels like a fairly average episode. It does throw out a mix of funny bits, and I’m glad it’s not as stale as “Duh-Vinci”, but it’s without great spark. Still, it’s enjoyable enough. The Late Philip J. Fry (aired July 29, 2010): “The Professor invents a one-way time machine that takes the crew ever further into the future with no hope of returning.” One of the series’ goofier episodes, “Late” definitely offers greater scope than most. It uses a wacky premise for good results. That Darn Katz! (aired August 5, 2010): “Earth is invaded by a race of intelligent cats.” As I noted earlier, I’ve never been wild about Amy, but I do like Nibbler, and he gets a good role here. The way the episode makes use of the feline elements delivers many delightful moments as well and helps turn this into a fine program. A Clockwork Origin (aired August 12, 2010): “The theory of evolution is put to the test on a planet inhabited by robots.” “Origin” handles potentially tricky material in a clever way. One could accuse it of attempting to have its evolutionary cake and eat it, too, but it provides a good sense of balance. It packs in plenty of humor along the way. The Prisoner of Benda (aired August 19, 2010): “A revolutionary invention allows the crew members to exchange minds.” “Benda” may come with the most convoluted Futurama story to date, but the episode pulls off the shenanigans in a delightful manner. Multiple examples of body switching lead to multiple examples of hilarity. Lrrreconcilable Ndndifferences (aired August 26, 2010): “After a bungled Earth invasion, alien leader Lrrr faces a midlife crisis.” Lrrr is a pretty one-note character, but the episode makes good use of him. It shoots fish in a barrel at a comic convention as well, but even though the jokes are easy, they’re still pretty good. I don’t like this one as much as “Benda”, but it’s a fun show. The Mutants Are Revolting (aired September 2, 2010): “Leela leads an army of underground mutants in a rebellion against the surface people.” I must admit I’ve never much liked the underground mutant shows, and this one doesn’t change my mind. It throws out a few decent bits but lacks much to make it better than mediocre. The Futurama Holiday Spectacular (aired November 21, 2010): “In this three-part episode, the Planet Express crew learns the true meaning of Xmas, Robanukah and Kwanzaa.” The show’s three-act structure emulates the “Treehouse of Horror” series from The Simpsons. Like those programs, “Spectacular” is hit or miss. The Xmas bit doesn’t work especially well, but with its emphasis on Bender, Robanukah fares better. Kwanzaa finishes things somewhere between those two polls; it’s not great, but it has some good bits like a kooky Raging Bull reference. 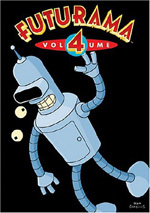 Futurama appears in an aspect ratio of approximately 1.78:1 on this Blu-Ray Disc. 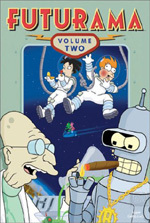 I’ve always been impressed with other Futurama releases, and the new series looked great. From start to finish, the shows offered excellent delineation. They were consistently crisp and distinctive, without any signs of softness. The programs lacked jaggies or shimmering, and I also noticed no signs of edge haloes or source flaws. Futurama always went with a bright, varied palette, and the new batch of shows followed that pattern. The episodes featured a nice range of hues that seemed lively and dynamic. Blacks were dark and deep, while shadows appeared clear and smooth. All in all, the episodes provided terrific visuals. Though not as dazzling, DTS-HD MA 5.1 soundtrack of Futurama was more than satisfactory. The mixes occasionally boasted lively material, usually due to space flights or mayhem. Those weren’t constant elements in the shows, but they cropped up often enough to add some zing to the series. Otherwise, we got good stereo music and a nice sense of general ambience. At all times, audio quality pleased. Speech was natural and concise, without edginess or other issues. Music appeared bold and full, while effects showed nice clarity. Those elements came across as dynamic and powerful. I thought this was worth a solid “B”. We find a positive set of extras here. All 13 episodes include audio commentaries. For these, executive producers Matt Groening and David X. Cohen and actors Billy West and John DiMaggio chat on all of them. In addition, we hear from directors Frank Marino (1, 8), Dwayne Carey-Hill (2, 9), Stephen Sandoval (3, 10), Crystal Chesney-Thompson (4, 11), Raymie Muzquiz (5, 12), and Ray Claffey (6, 13), writers Maiya Williams (5) and Lewis Morton (7), supervising director Peter Avanzino (1, 2, 5, 7, 8, 9, 11, 12, 13), producers Claudia Katz (1, 2, 4, 6, 7, 8, 9, 10, 11, 12) and Lee Supercinski (3, 4, 6, 7, 8, 10, 11, 12, 13), co-executive producers Eric Horsted (1, 6, 7, 12), Dan Vebber (3, 9), Michael Rowe (4, 6, 10, 13), Patric M. Verrone (5, 8, 11), and Josh Weinstein (10, 13), and actors David Herman (2, 3, 9), Tress MacNeille (3, 9), Lauren Tom (4, 6, 10), and Maurice LaMarche (5, 8, 11). If you listened to commentaries for prior Futurama programs, you’ll know what to expect here. Cohen tends to act as master of ceremonies, and that’s a good thing, as he keeps matter on topic. We learn about the series’ restart as well as aspects of various story/character elements, some animation topics, and performances. With Simpsons commentaries, the actors usually don’t add much, but that’s not the case here. West and DiMaggio are always irrepressible; they throw out jokes and impersonations that enliven the proceedings. Though the tracks occasionally sag, they’re usually informative and fun. Disc One includes a collection of 22 Deleted Scenes. These run a total of 10 minutes, 19 seconds, and they mostly consist of finished animation; a few use storyreels, but not many. The clips also tend to offer brief additions to existing sequences, which makes sense when you figure they average less than 30 seconds a scene. The biggest addition comes from a reveal of the “Sand Hogs” who became the mutants in “Revolting”. Otherwise, we just get short snippets. They’re quick but enjoyable. On Disc One, we also get a featurette called Behind the Fungus: Makin’ a Hit Song. This four-minute, 59-second piece focuses on actor Billy West as he talks about the creation of a tune used in the “Proposition Infinity” episode; we also get some comments from guitarist Greg Leon. Mostly we watch the two as they wail on guitars. Not much actual info emerges. We finish Disc One with Previously on Futurama. This goes for one minute, 21 seconds and provides some unused opening animation created for the four direct-to-video movies. It’s a fun addition. Over on Disc Two, we begin with an “original video comic book” called The Adventures of Delivery-Boy Man. Purportedly “scribbled and performed by Philip J. Fry”, it runs seven minutes, 14 seconds and gives us a program based on the piece seen during “Lrrreconcilable Ndnifferences”. It’s a lot of fun and a nice bonus here. We can check out the comic with or without commentary from Cohen, Groening and . They tell us about the comic’s origins and aspects of its creation. They give us a good discussion of this extra. Next comes a music video. “Bend It Like Bender” lasts two minutes, 42 seconds and compiles a bunch of Bender snippets, many from prior incarnations of Futurama. We watch these along with a jaunty little tune. This is a cute extra but not anything memorable. A live table read for “The Prisoner of Benda” fills 35 minutes, 10 seconds. It gathers cast and crew to offer an initial run-through of that episode’s script. As we listen to the read, we see storyboards for the episode. This is a cool addition, though I’d like the option to watch the actors at work; while it’s nice to see the boards, it’d be just as fun to check out video footage of the run-through itself. Futurama returns from the dead yet again, and it does so with satisfying results. As usual, not all of the shows are winners, but most are quite entertaining, and a few classics emerge. The Blu-ray boasts excellent visuals as well as very good audio and supplements. 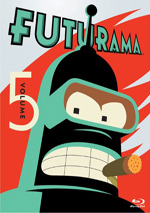 I’m happy to have more Futurama and feel sure fans will enjoy these programs.